Palmer's Cocoa Butter Formula with Vitamin E Cream is a non-greasy, luxuriously rich all-over lotion to leave your skin so touchable. 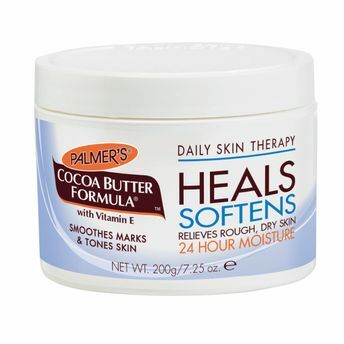 Palmer's Cocoa Butter Formula is enriched with Cocoa butter and vitamin E which deeply moisturize the skin making it soft and supple. It does feel heavy like any other body butter, it light and absorbs quickly into the skin. Explore the entire range of Stretch Mark Cream available on Nykaa. Shop more Palmer's products here.You can browse through the complete world of Palmer's Stretch Mark Cream .Alternatively, you can also find many more products from the Palmer’s Cocoa Butter Formula with Vitamin E Cream range.